From May 10-13, Quitman County will commemorate the fiftieth anniversary of the Mule Train March that Dr. Martin Luther King, Jr. planned during his fight on the war on poverty in the Mississippi Delta. In 1968, Dr. King had walked and marched down Highway 3 in Marks, Miss. to highlight social and political discontent during the Civil Rights Movement. Today, that same main thoroughfare bears his name and the legacy of changes that his visits, three to Marks and Quitman County in all, facilitated. Dr. King visited many schools and homes of local leaders to help launch this second War on Poverty. 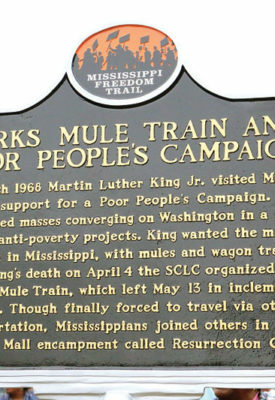 One of the many lasting legacies that Dr. King’s efforts wrought is that of the Mule Train March, which was the centerpiece of the Poor People’s Campaign and was supposed to be led by Dr. King in May 1968. Tragically, Dr. King was assassinated in April of that same year, but Reverend Ralph David Abernathy, whom Dr. King knew from traveling with him through the Mississippi Delta, carried out the Marks to Washington D.C. March.